When it comes to protecting your Chaparral boat, finding the right type of boat covers or boat tops is a very important step. Your boat may sit in the open air for weeks or months unprotected from the elements, sunlight and other factors that can damage the more delicate interior materials such as the seat covers. Having a custom marine canvas by Chicago Marine Canvas covering your craft not only provides protection from the elements, but other factors that may damage your interior over time. Plus, the materials used in the creation of the covers are tough, durable and long lasting for fewer boat canvas repairs. 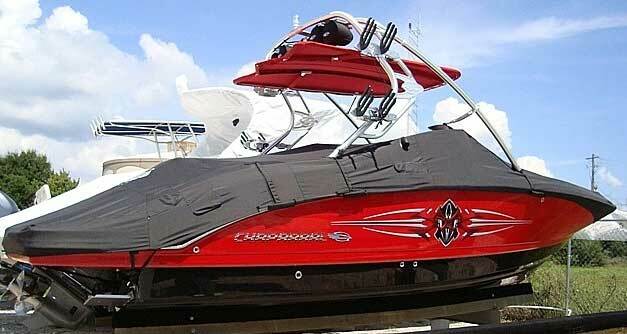 Why Choose Custom Chaparral Boat Covers? It may seem at first like you are saving money by purchasing a cheap, generic tarp or cover for your boat. However, there are definite advantages to having a custom-made cover for your boat that is designed to last for at least 8 to 10 years, far longer than many of the cheaper, generic varieties. Protection from the Elements: Wind, rain, sea spray and the other elements which may do little harm to the exterior of your Chaparral boat but will do damage to the inside of your boat over time. You can help prevent much of that damage by keeping a custom cover tightly on top. This will not only prevent the damage from occurring, but the custom design will fit tightly enough that the water will have far greater difficulty seeping inside. UV Protection: If your boat is kept out in the sunlight, then the ultraviolet rays are doing damage to the seat covers and other vulnerable materials found inside your craft. The custom boat cover will keep out the harmful UV rays which mean that there will be far less damage and fewer repairs or replacements which are needed. Easier Maintenance: Whether your take your boat on the ocean, lake or river, whenever you have left it unused for a period of time you usually have to clean out the dirt, dust, leaves and other debris that has settled into the inside of your craft. 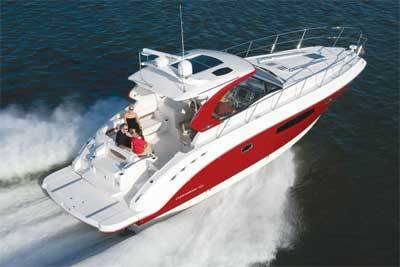 With a custom boat top, all you need to do is remove it and you are ready to go. This way, you spend less time cleaning and more time out on the waves. Custom boat covers are carefully measured to fit your craft perfectly so that they will not only provide maximum protection, but also take up as little storage room possible when they are not being used. This means that you can fit them tightly over your boat during the times of the year when you are not using your craft and be assured that it will effectively resist the elements for years to come. Chaparral boat covers are expertly made from high quality materials so that they will last a very long time while maintaining their integrity. This means fewer boat cover repairs which will save you money in the long run. If you are looking at boat tops for your craft, a custom cover may be the right choice for your needs.